Manchester United are reportedly close to extending the contract of goalkeeper David de Gea after accepting to double his current salary package. The Spaniard had been reluctant to discuss a contract renewal earlier in the season and this saw the club trigger the 12-month extension clause available to prolong his stay until the summer of 2020. Since then, United have witnessed a change in management with Ole Gunnar Solskjaer replacing Jose Mourinho at the helm and the club have since been on a roll with six straight wins in all competitions. 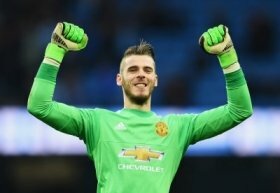 According to The Sun, De Gea has been convinced to sign a new long-term deal with the Mancunian giants following the departure of Mourinho, who had a negative impact on the first-team squad. It is added that the Spaniard has been offered bumper wages of around £400,000-a-week with the extension and this represents a 100 percent increase on his current salary package with the club. De Gea recently made 11 second-half saves in the Premier League game at Tottenham Hotspur where United won by a slender 1-0 scoreline. Marcus Rashford netted the winner before the half-time whistle.